Your body gets energy from fats, proteins and carbohydrates. Your body needs all three of these substances to work properly. Proteins and carbohydrates are converted into energy using different chemical pathways, which affects how quickly the energy is available for you to use. While both nutrients can provide energy, there are distinct advantages and disadvantages to using carbohydrates as energy, because it allows your body to spare building protein. Carbohydrates are one of the main sources of energy for your body, along with protein and fat. 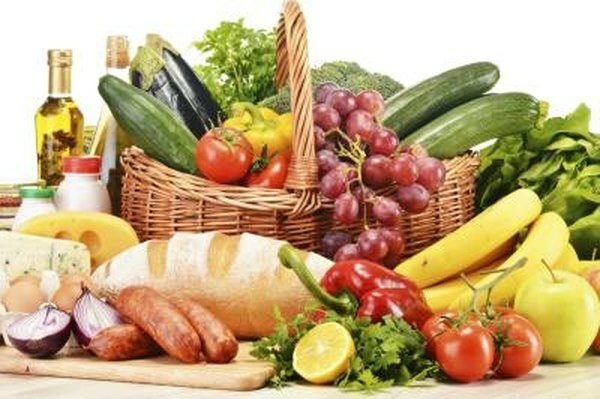 Carbohydrates are generally available in plant-based food sources and should make up 45 to 65 percent of your calories each day. Protein, which can be found in both animal-based and plant-based foods, should make up 10 to 35 percent of your calories. Both proteins and carbohydrates provide 4 calories per gram. When you eat carbohydrates, your digestive tract breaks them into simple sugar, such as glucose. Your intestines then absorb the glucose and transport it into your bloodstream, where it causes a rise in blood glucose. When your blood glucose levels rise, your pancreas secretes insulin, which causes your muscle, fat and liver cells to pull glucose out of the blood. The glucose is then turned into energy via a series of chemical reactions known as the Krebs cycle. Your brain needs carbohydrates to function properly, and other tissues -- including your muscles -- prefer to use carbohydrates as fuel. When you consume proteins, they are broken down into amino acids, which the body can use to make new proteins. Amino acids cannot be directly used for energy, but they can be converted into other molecules, which can then be plugged into the Krebs cycle to generate energy, the Rensselaer Polytechnic Institute in Troy, NY, notes. Some amino acids can also be used to make sugars when your blood sugar levels get very low. When you consume carbohydrates, your body is able to use the energy relatively quickly because glucose is easily turned into energy. Proteins, on the other hand, take longer to be converted into energy, but because of this protein is a longer-lasting energy source. However, burning protein for energy also means your tissues can't use protein to maintain themselves, which is a definite drawback if you're trying to build muscle tissue.